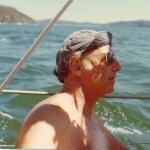 Successful veteran yachtsman and gentleman, John Walker, passed away peacefully at Royal North Shore Hospital yesterday with is family around him, three months shy of his 92nd birthday in October. 'Gentleman Johnnie Walker', a long-time member of Middle Harbour Yacht Club, bounced back from pneumonia and a subsequent heart attack in 2012. He would have been philosophical about his death - happy to have lived as long and happily as he did - only sorry to leave the family he loved so much behind. Humour well intact, he told a photographer at the Sydney Short Ocean Racing Championship in November that year: "There will be an extra charge if you want me to pose ... and more if you keep me waiting!" He also bragged that he was older than Tig Thomas, a past commodore of the Club, also racing at the event. John and his reliable Three Quarter Tonner, Impeccable, which describes John to a tee, was designed by Doug Peterson to the old IOR rule and built in Sydney by Doug Broker in 1980. The two contested 25 Sydney Hobart races together. Unusually, his first was as a 60 year-old, the last was the 2008 race when he was 86. He was celebrated as the oldest person to contest the Hobart race in its history, an achievement only equalled by Syd Fischer in the 2013 race. Best Hobart results for the twosome were: - second overall (IOR) and won Division D in 1986; third overall (IOR) and won Division B in 1993 and fifth overall (IRC) and third in Div E in 2006. These and other great victories, such as third overall in the '82/'83 Blue Water Point Score, and second overall the following five seasons consecutively, and wins and places in the Sydney Mooloolaba, Gosford Lord Howe Island, both of which he won in 2004. All resulted in the master yachtsman being awarded Ocean Racing Veteran of the Year in 1994, 2003, 2004 and 2008 by in the Cruising Yacht Club of Australia annual awards. Among other wins with Impeccable, John claimed MHYC's Gillawa Shield in '83/'84, '86/'87 and '90/'91. The two were also a member of MHYC winning team in the CYCA's Commodore Cup in '90'91, '91/'92 and '92/'93. The gentle and extremely likable man was held in high esteem and attracted a long-term dedicated crew. Leaving a lot of the deck work on long ocean races to the crew, John's secret to success was his navigating skills. He had an uncanny knack of picking wind, shifts and current, which converted to his winning the MHYC Navigator's award in 2009. Felicity Nelson completed 12 of her 19 Hobarts on Impeccable, only moving on when John announced he would call ocean racing quits. It says spades about the man who was remarkably nimble for his 92 years and looked years younger. I feel privileged myself to have known and interviewed him over a 25 year period, all of them involving honesty, integrity, fun and a lot of laughter. Boat and owner remained competitive to the end. John skippering Impeccable to wins and places in major MHYC events such as the Sydney Harbour Regatta and Sydney Short Ocean Racing Championship, including this year. 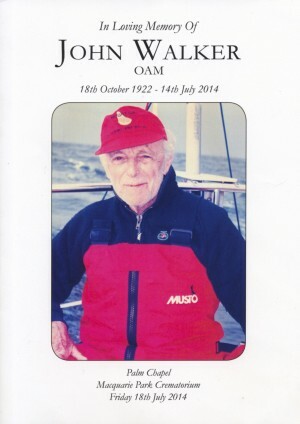 He loved that boat, sailing and the camaraderie that came with it. That he could be all that he was belies John's earlier life. Born Ota Wachtel in Czechoslovakia on October 18, 1922, John met his wife Helen in 1945 in Prague. They married in 1948 and migrated to Australia in 1949, unable to speak English. The couple had 50 pounds of luggage and just five pounds in cash to their names, having to sign all else to the Communists in Prague just to get their passports. Both were sent to Theresienstadt Nazi concentration camp in Czechoslovakia during World War II. John was later moved to Auschwitz. Both lost family in the camps. John was unusually frank about his wartime experiences and his treatment at the hands of Hitler and his regime. John never let those bad times dictate his life. He said he and Helen were so happy to survive that they decided to always be happy and celebrate life when he and Helen moved to "beautiful", Australia, where they had two children and became grandparents. A qualified engineer, John had to finish his education after the war, but his first job on Australian soil was teaching ice skating. He had started ice skating competitively at 12, and by 16 was the Czechoslovakian Pairs Figure Skating champion. John said it was hard work and great training for not giving when in the concentration camps. Helen supported John later on when he started a timber business, at which time he changed his name by deed poll from Ota Wachtel to John Walker, on having repeatedly to spell his name for people. He had seen an ad for Johnnie Walker whisky, liked it. The business eventually flourished and he was awarded an Order of Australia for services to the building and timber industry in 1966 of which he and Helen were inordinately proud. John is survived by his loving wife Helen and children Gary and Susan and their families. Our sympathies go to them.